Pre-heat oven to 200°C or 180°C fan oven or gas mark 6. On a floured board roll out the shortcrust pastry and line a 9″ greased quiche dish. Allow the pastry to chill in the fridge for 30 minutes. Line the pastry base with parchment paper, fill with dry beans or baking weights and bake for 18 minutes. Remove from the oven and take out the beans and parchment paper and cook for 5 more minutes. Meanwhile, poach the Goatsbridge trout fillets in a little milk for 8-12 minutes depending on their size. Drain the trout but hold onto that delicious poaching liquid. Allow to cool slightly before flaking and please watch out for any bones that escaped our pin bone machine! Melt the butter on the pan and sauté the onion until caramellised. Add the trout and saute for one minute. Stir in the wine and mixed herbs. In a separate bowl whisk the eggs and season well with the salt and pepper. Stir in half of the grated cheese followed by the flaked trout and onion and cooled poaching milk. 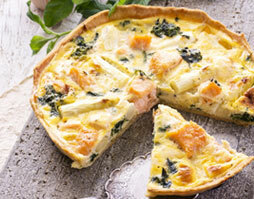 Stir in the extra cream or milk and pour this cheesey-trouty mix into the pastry shell. Sprinkle the remaining cheese over the pastry shell. Turn the oven down to 180°C or 160°C fan oven or gas mark 4. Place on a baking sheet and bake for about 40 minutes until the cheese is bubbling and the inside wobbles slightly but isn’t liquidy. Remove from the oven and allow to cool for a moment before serving in chunky wedges with salad and roast beetroot.